KT SAT now has an agreement with Mongolian Satellite Operator (DDISH TV) for the collaboration of migration and promotion of a new DTH service with the KT SAT's new satellite, KOREASAT-5A. KT SAT has made the multi-transponder lease agreement with Mongolian satellite TV operator (DDISH TV) and agreed that KOREASAT-5A Mongolia Beam is named as “MONGOLSAT” in 2016. 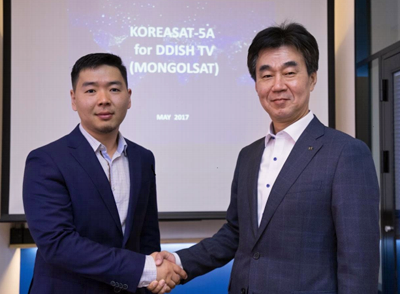 DDISH TV is the only one DTH operator in Mongolia and plans to expand premium high-definition channels for Mongolian customers using KOREASAT-5A satellite. Mr. BARS Ganbold (CEO of DDISH TV: Left) shakes hands with Mr. Wonsic Hahn (CEO of KT SAT: Right) after the signing of the collaboration agreement between the two companies. DDISH TV will start using KT SAT’s KOREASAT-5A satellite from the fourth quarter of 2017 and be able to strengthen its competitiveness of the direct-to- home (DTH) satellite broadcasting service and to provide Mongolian customers with high quality DTH and VSAT broadband services using high power satellite, KOREASAT-5A. DDISH TV is Mongolia’s largest satellite broadcasting company, with some 330,000 subscribers since it started the business in 2008. DDISH TV plans to increase local and foreign channels and to expand NVOD services, contents, and channels after migration to new satellite. DDISH TV is closely cooperating with Mongolian leading mobile operator Unitel group on its customer service, content and loyalty program. It improves content quality and customer satisfaction of both companies. KT SAT plans to launch the KOREASAT-5A satellite in fourth quarter of 2017. KOREASAT-7 was launched successfully on May 5th, 2017, in a move to expand the firm's coverage into Asian countries, including Mongolia, the Philippines, Indonesia, India, Indochina countries, and Pakistan. Mr. BARS Ganbold, CEO of DDISH TV, added that the company's goal is to strengthen their market leadership in the satellite broadcasting service with premium HD channels and high quality service using high power satellite.